Practice Area: The practice area is generous and includes a driving range, chipping area and putting green. Description: This lakeside course is situated about halfway between Charlotte and Pinehurst, making it a nice stop on your way to/from your golf vacations or a quick day trip. You can easily find the course off Hwy 24/27 after you pass through Albemarle. The scenic layout is situated on Lake Tillery and runs through dense hardwood forests on the halcyonic western edge of the Uwharrie Mountains. The course covers over 540 acres. 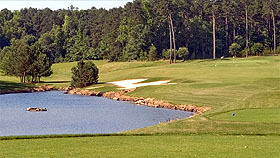 The course has drawn a good deal of praise and was named one of the three "Best New Courses" in 2002 by North Carolina Magazine. B-Man's Take: Finally made the trip to play this course in July 2015. It is indeed a scenic layout with hilly terrain similar to a mountain course. The greens are bent-grass and several have challenging slopes and tiers. There are quite a few long par 4 holes here, especially the 3 hole stretch of #13-15. I did like the two par 5's on the back, #10 and #18 -- both give good players chances to get home in two with long drives. The greens had several issues with bare spots when I played in mid-summer. Check recent reviews or ask the pro shop before you play to make sure they are in good shape. This course can be a fun challenge and is worth playing if the conditions are right. 10/1/17 - Msg Board Posting by BetterThanMost titled "Re: Tillery Tradition Status"
4/24/17 - Msg Board Posting by BetterThanMost titled "FYI - Tillery Tradition"